This time last year we had the Bittern Bonanza at Fivebough wetlands with 34 birds recorded on the evening of 20 November. This year with all the winter rain both Fivebough and Lake Coolah, in particular, are again full as they were in March 2012 and the water birds have taken great advantage of the abundance of food in order to breed. This breeding breeding bonanza is also happening at Campbell's and Nericon Swamps and possibly at Tuckerbil as well if access into the swamp was easier. As Fivebough started to fill in mid-year, the Black Swans were the first to take advantage of the increased water level and, by late July, Keith Hutton had recorded an amazing 71 nests scattered about the wetlands particularly in the northern end where they could be easily seen from Hooey Lookout. The first cygnets started appearing around early August. Since then and with more persistent rain in August/September, all other birds have been induced to breed in great numbers. This has been particularly noticeable at Fivebough and Lake Coolah where it is relatively easy to see the birds, despite Fivebough being inaccessible still beyond the Information Centre. Purple Swamphens, Moorhens and Coots have all got young in many family groups whereas, the grebes; Great Crested, Hoary-headed and Australasian have bred but only a small number of chicks have been seen. But that doesn't mean they have been less successful, it's just that they are more secretive and keep their chicks well hidden in the reeds. Duck species with young that have been seen are Black, Musk, Blue-billed, Wood, Grey and Chestnut Teal, Plumed-Whistling, Hardhead and Australasian Shoveller. So far there has been no sightings of Pink-eared ducklings and Keith reported 2 pairs of Wandering Whistling Duck and Plumed Whistling Duck at Fivebough on 23 November so, hopefully, they might stay around and breed successfully as well. There has been no sightings of any Freckled Duck and not many are being reported on Birdline from any eastern State. They are possibly further inland as there is no shortage of suitable habit everywhere this season. 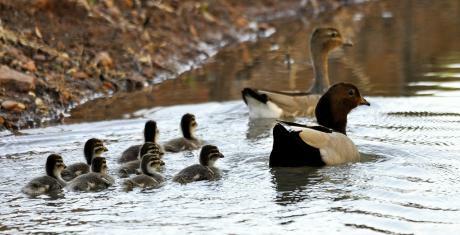 Up to 14 Magpie Geese have been seen at Fivebough and up to 8 at Lake Coolah. It wasn't until 25 November that proof of their breeding was confirmed when I saw a family of newly hatched goslings at Fivebough. When Neil and I did the bird count at Campbell's and Nericon Swamps on 26 November, we were surprised to find more than 50 geese at the two swamps with many young birds from very tiny goslings to half-grown juveniles, indicating successful breeding at both wetlands. 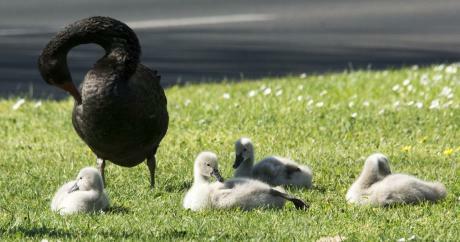 Black Swans too have continued to breed with a few new nests at Fivebough and many more at Lake Coolah. So they have had a very successful year locally as I don't recall as many in the past 10 years. Swan breeding has also occurred at Campbell's Swamp, Nericon and Barren Box. To top this successful breeding event off, I spotted a pair of Brolgas with a juvenile on 16 November at the northern end of Lake Coolah so they have also taken advantage of the good season. Black-winged Stilts have also been breeding and despite several nests being drowned early in August when the water level rose, some were successful in raising young and at present there are many nests at both Fivebough and Lake Coolah. It is also interesting to note that, despite the breeding successes mentioned above, the numbers of ducks at the various swamps are very low compared with past years when water wasn't so readily available as it is this year. This time last year, there were hundreds if not thousands of Grey Teal about but not this year. Such is the dispersal because of the large numbers of wetlands that can support them. Also, Whiskered Terns are about but not anywhere near the numbers that come and fly over the rice fields at this time of year. I have seen none over the rice but numbers over the swamps. Most noticeable of all, is the lack of Glossy Ibis in the area. Instead of the usual thousands that come when the rice is planted, there are none. Obviously, places like the Macquarie Marshes are a greater attraction this season. Such is the change after a very wet winter in our region.